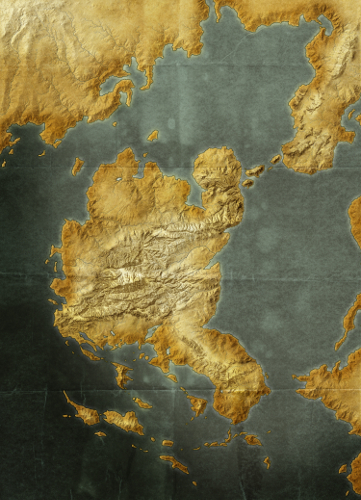 Welcome to ars phantasia, a blog about fantasy cartography and game design. Regarding the former topic, I’ll be discussing how and where to begin creating maps digitally, offering walk-throughs on map creation techniques and displaying projects that I’m working on. As to the latter, much of what I will be talking about centers around game theory and analysis. We’ll be looking at the ways in which certain assumptions are built into various rule-sets, and how these rule-sets in turn structure and facilitate certain modes of game play. In the course of time I intend to look at specific structures such as the dungeon crawl and the hex crawl. In addition, I am also in the process of developing a revised version of the third edition of the D&D rules, the intended aim of which is a system conducive to a more fast paced, grim and gritty mode of play. Beta content for this new system will be released here in due time.